For the imaginative builder . .
to build a fascinating world of blocks. inches in diameter and is 12 inches long. corners, come in 4 non-toxic colors. chimney and roof pieces. 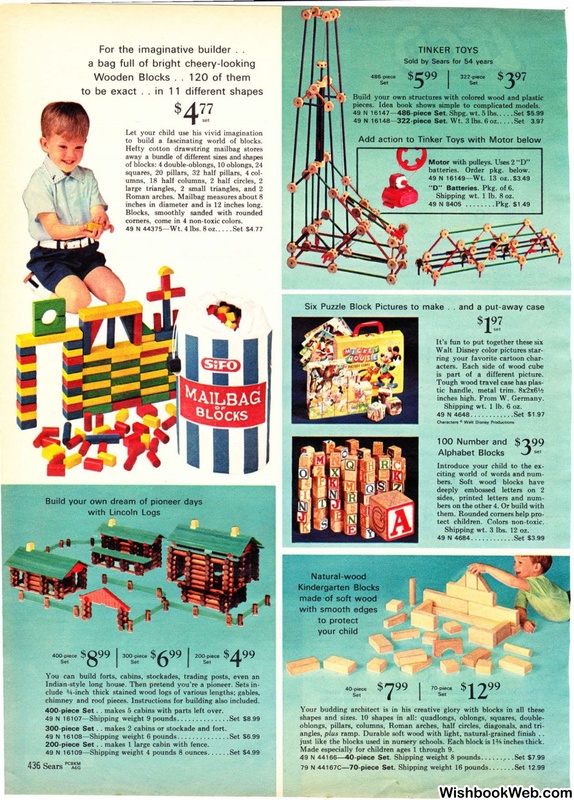 Instructions for building also included. 400-piece Set .. makes 5 cabins with parts left over. 300-piece Set .. makes 2 cabins or stockade and fort. 200-piece Set . . makes 1 large cabin with fence. 49 N 16147- 486-piece Set. Shpg. wt. Motor with pulleys. Uses 2 "D"
"D" Batteries. Pkg. of 6. Shipping wt. 1 lb. 8 oz. is part of a different picture. inches high. From W. Germany. Shipping wt. 1 lb. 6 oz. Shipping wt. 3 lbs. 12 oz. ramp. Durable soft wood with light, natural-grained finish ..
Made especially for children ages 1 through 9.